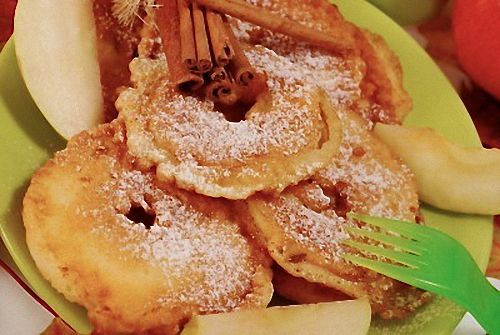 Authentic Pennsylvania Dutch dessert recipes mean good cooking and good eating, and these old fashioned recipes are no exception. They're not difficult to make, and they all call for wholesome, all-natural ingredients. 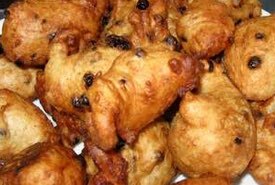 From the traditional Dutch apple fritters pictured below, to the Dutch country molasses pie, the little lemon cakes, and decadent chocolate cream candy, there's something for every taste here. Get ready to enjoy some authentic Dutch/German cooking. 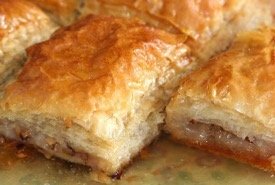 The following Pennsylvania Dutch Dessert Recipes are authentic and traditional having come from the descendants of early Germanic families who settled in the Pennsylvania counties. Pare and core 4 large tart apples. Cut each apple into about 4 round slices and allow the sliced apples to lie a couple of hours in a dish containing 2 tablespoonfuls of brandy, mixed with a half teaspoonful of cinnamon and a half teaspoonful of sugar. Drain the sliced apples, then a few at a time should be dropped in the following batter, composed of: 1 cup of flour sifted with 1/2 teaspoonful of Royal baking powder, 1/4 teaspoonful of salt, add the yolks of 2 eggs and 1 cup of milk to form a smooth batter, then add the stiffly-beaten whites of eggs. Fry light brown, in deep, hot fat, and sift over powdered sugar. "Fried Apples" are an appetizing garnish for pork chops or a tasty dish served on their own; the apples should be cored, not pared, but should be sliced, and when cut the slices should resemble round circles, with holes in the center. Allow the sliced apples to remain a short time in a mixture of cinnamon and brandy, dry on a napkin, and fry in a pan, containing a couple of tablespoonfuls of sweet drippings and butter. Place in an agate stew-pan 2 cups of granulated sugar, 1 cup of sweet milk, butter size of an egg. Cook all together until it forms a soft ball when a small quantity is dropped into cold water. Then beat until creamy. Add half a cup of any kind of chopped nut meats. Spread on an agate pie-tin and stand aside to cool. For the top layer take 1 cup of sugar, 1/2 cup milk, butter size of an egg, and 2 small squares of a cake of Baker's unsweetened chocolate. Cook together until it forms a soft ball in water. Beat until creamy. Add half a teaspoonful of vanilla, spread over top of first layer of candy and stand away until it hardens and is quite cold. For this Pennsylvania Dutch dessert recipe, make a rich crust, line a pie-tin and fill with clean, hulled strawberries. Allow one quart to each pie. Sweeten to taste; sprinkle a generous handful of flour over the berries, having plenty of flour around the inside edge of pie. Use 1/2 cup of flour all together. Cut a teaspoonful of butter into small bits over top of berries, cover with top crust with vents cut in to allow steam to escape, pinch edges of crust together to prevent juice escaping from pie, and bake. To 2 apples, cooked soft and mashed fine (after having been pared and cored) add the yolk of one egg (well-beaten) one minute before removing the cooked apple from the range. Then add 1 small cup of sugar, a piece of butter the size of a hickory nut, 1 teaspoonful of flour; flavor with either lemon or vanilla. 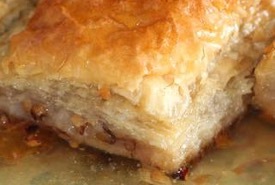 Line a pie tin with rich pastry crust. Pour in the mixture and bake in a quick oven. This Pennsylvania Dutch dessert recipe makes a delicious old fashioned dessert pie. For this Pennsylvania Dutch dessert recipe, place in a mixing bowl 3/4 cup flour (generous measure), 1/2 cup granulated sugar, 1 generous tablespoonful of butter. Crumble all together with the hands until quite fine. Then to 1/4 cup of New Orleans (baking) molasses add 1/4 cup of boiling water and 1/4 teaspoonful of soda. Beat together the molasses, water and soda until the mixture is foamy and rises to top of cup. Then pour into a medium-sized pie tin, lined with pie crust (the pie tin should not be small or the mixture, when baking, will rise over top of pan). Sprinkle the prepared crumbs thickly over the molasses mixture and with a spoon distribute the crumbs well through the mixture. Bake in a moderate oven from 25 to 30 minutes and you will have the old fashioned pie your Grandmother used to bake. When her baking finished, she had dough remaining for an extra crust. Children always called this "molasses candy pie," as 'twas quite different from the "molasses cake batter" usually baked in crusts. Mix together same as ordinary cake and bake in a loaf. This Aunt Sarah considered one of her finest cake recipes. She had used it for years in her family. The friend who gave this Pennsylvania Dutch dessert recipe to Aunt Sarah said: "A couple of tablespoonfuls of brandy will improve the cake!" One cup sugar, 1/2 cup butter and lard, mixed; 2 cups flour and 2 teaspoonfuls of baking powder, 2 eggs, 1/2 cup sweet milk. For this Pennsylvania Dutch dessert recipe, crumb together with the hands the sugar, butter, flour and baking powder sifted together. Take out 1/2 cup of these crumbs to be scattered over top of cake. To the remainder add the yolks of the eggs, well beaten, and the sweet milk, and lastly the stiffly beaten whites of eggs. Put the mixture in a well-greased pan (a deep custard pie tin will answer), scatter the half cup of crumbs reserved over top of cake and bake about 3/4 of an hour in a rather quick oven. When cake is baked, sprinkle over 1 teaspoonful of melted butter and dust top with cinnamon. Beat the butter to a cream and gradually add the sugar. Then add the unbeaten egg and beat all together thoroughly. Add milk and flour and beat hard for five minutes. Add baking powder, salt and nutmeg. Pour into two small greased pie-tins and before putting in oven sprinkle sugar and cinnamon over top. This is an excellent breakfast cake, easily and quickly made, a very traditional Pennsylvania Dutch dessert recipe. For Mary's old fashioned molasses cakes, she creamed together 1 cup of light brown sugar and 2 tablespoonfuls of butter. Then added 1 cup of New Orleans molasses. The molasses had been allowed to come to a boil, then cooled. She sifted into the mixture 4 cups of flour alternately with 1 cup of sweet milk in which 2 even teaspoonfuls of soda had been dissolved. She beat all well together, then added yolk of one large egg, and lastly the stiffly beaten white of the egg. Beat the mixture again and bake in 2 square layer cake pans in a hot oven about 25 minutes. This old Pennsylvania Dutch dessert recipe makes an excellent cake if directions are closely followed. Boil 1 scant half cup water with 1 cup sugar until it spins a thread, or forms a soft, firm ball in cold water. Pour slowly over the stiffly beaten white of egg, beating while it is being poured. Melt 2 squares or 2 ounces of unsweetened chocolate by standing the bowl containing it in hot water. Add 1 teaspoonful hot water to chocolate. Stir the egg and sugar mixture slowly into the melted chocolate. Beat until stiff enough to spread on cake. Aunt Sarah made these to perfection and called them "Pebble Dash" pie. They are not really pies, they resemble cakes, but having a crust we will class them with pies. She lined three small sized pie-tins with rich pie crust. For the crumbs she placed in a bowl 3 cups of flour, 1 cup brown sugar, and 3/4 cup of butter and lard, mixed and rubbed all together with the hands, not smooth, but in small rivels [crumbs]. For the liquid part she used 1 cup baking molasses, 1 cup hot water, 1 teaspoonful baking soda dissolved in a few drops of vinegar and stirred this into the molasses and water. She divided the liquid among the three pans, putting one-third in each crust, over which she sprinkled the crumbs. Bake one-half hour in a moderate oven. These have the appearance of molasses cakes when baked. A very traditional Pennsylvania Dutch dessert recipe. The traditional shoo fly pie recipe didn't call for chocolate, but some cooks were known to put chocolate icing on top on occasion, and sometimes sweetened whipped cream. There are modern variations of the pie, which is really more like a coffee cake with a molasses filling, and in recent years the "shoo fly" name has been carelessly lent to different, non-molasses pies. It's thought that the pie's unusual name comes from flies being attracted to its sweet molasses filling while the pie sat cooling in the open window of the farmhouse kitchen. The Pennsylvania Dutch people are the descendants of Germanic peoples who emigrated to the United States from Germany before 1800. They mostly settled in the state of Pennsylvania, but some live in other nearby states as well. "Their dialect, the so-called 'Pennsylvania German' or 'Dutch,' as it is erroneously called by many, is a dialect which we find from the Tauber Grund to Frankfurt am Main. As the German language preponderated among the early settlers, the language of different elements, becoming amalgamated, formed a class of people frequently called Pennsylvania Dutch." The early settlers brought their love of good food with them, and these Pennsylvania Dutch dessert recipes ensure their legacy. Enjoy making some traditional, lip-smacking-delicious treats.